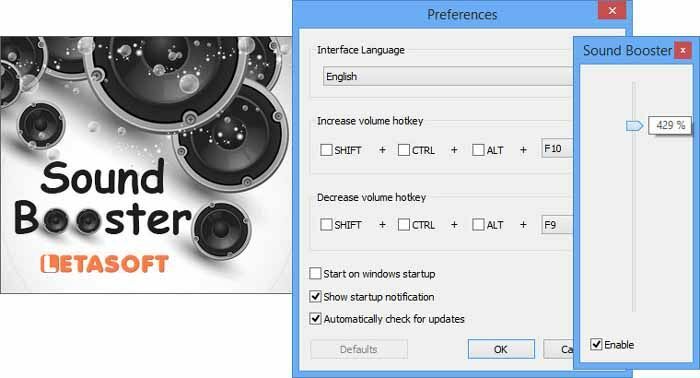 Free download Sound Booster latest version 1.10.478. Letasoft Sound Booster can be used as an extra amplifier when the volume of the program you are listening to is too low for comfortable listening and you feel that your PC’s speakers can produce a louder sound. This can be the case when the audio or video has been recorded at the level below normal. Or, for example, when the other person’s microphone you are talking to on Skype, is not working properly. There can be a plenty of other reasons why the sound is being too quiet and there is not much you can do about it except buy external speakers.